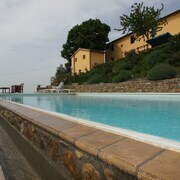 Beautiful setting with amazing facilities The apartments are in a hill near Vinci, they are very clean and have all the necessary items for a confortable stay. The view is excellent and the atmosphere relaxing. Driving distances of less than an hour to Pisa or Florence. Unser Genießer Urlaub im Traumhaus Uns hat es im großzügigen, toskanischen Bauernhaus super gut gefallen. Das Wohlfühlen ihrer Gäste liegt der Vermieterin sehr am Herzen. Herzlichen Dank. A grand getaway with fine accommodations is a vision that so many people have to pay top dollar to see come true. We understand that your upcoming trip is a significant investment. If you enjoy having all the amenities of home nestled in the middle of a breathtaking environment, you are sure to be pleased if you book a Vitolini lodge. These charming lodges are a quaint departure from everyday life—a step back in time and a step closer to the rugged elements that define the country. They're not exactly like the modern hotel in a city center—not even close—and that's part of their beauty. Do you have a lodge already in mind? Use Expedia's filters to find the perfect lodge for your upcoming stay. Once you check in, ask around for things to do in the area. There's plenty to do, and you may even have access to more excursions now that you're staying in a lodge. The list is endless—from fishing to canoeing, shopping to walking tours, you can really do as much (or as little!) as you want when you book with us. Your vacation will be an experience you won't soon forget. Don't just make your reservations at any old timeshare, especially when you can get a lodge with us for your group, and for a great price. When you stay in a lodge in Vitolini, you're not just close, you're there! You're going to be amazed by how close you are to the incredible scenery right outside your bedroom window. So pack your bags, load the car, and hit the dusty trail, because your Expedia lodge adventure awaits.